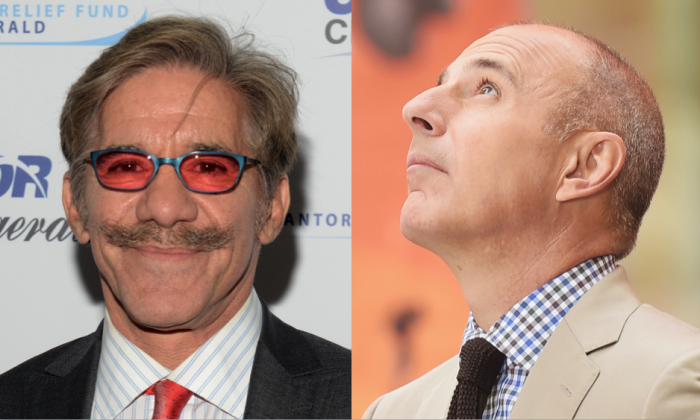 While many prominent personalities are joining the fray and denouncing recently-fired “Today” show host Matt Lauer, one of the former NBC morning program anchor’s celebrity friends has voiced his support. Geraldo also questioned the motivation of some harassment complainants, saying money or wanting to “get even” might be what’s driving them. Fox News issued a statement in response to Rivera’s tweets on Wednesday, Nov. 29, according to CBS. Lauer faces accusations of inappropriate sexual conduct with respect to multiple women and was dismissed by NBC officials on Wednesday, Nov. 29, following a detailed complaint from a female co-worker. Please help support independent journalism by sharing this article far and wide on social media. Thanks!